Interests include the application of information technology to scientific research, instruction, advisory service and institutional management. Specific interests and past duties include the capture, management, analysis and presentation of research data in support of the Institute's missions. Served in the past as the Scientific Data Manager for the Institute, responsible for the maintenance of scientific data archives containing environmental monitoring and research data for the Chesapeake Bay and mid-Atlantic region. The archives include data collected by Institute scientists as well as outside agencies and organizations. Some of these collections are continuous to the early 1900's. 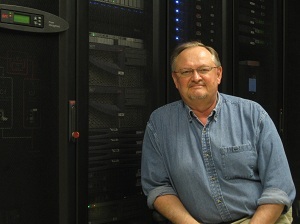 Responsible for the Institute's High Performance Computing initiative, presently a 24-node parallel cluster. Serves also as consultant to faculty, students and staff on a variety aspects of scientific data acquisition, analysis and management. Involved at the investigator level in the design and technical implementation of a variety of data acquisition and retrieval systems, including meteorological, hydrological, fisheries, and benthic monitoring systems. Internet Access to Cumulative Wetland Impacts in Virginia - Co-PI with Mr. Lyle Varnell, funding from U.S. EPA. Chesapeake Bay Submerged Aquatic Vegetation Mapping - Co-PI with Dr. Robert J. Orth, funding from U.S. EPA, NOAA, Va., Md. Chesapeake Bay Contaminated Sediment Database Development - Co-PI with Maynard Nichols, funding from USGS. Va. Baylor Grounds Digitization - Co-PI with Roger Mann - Digitization of Virginia Public Oyster Grounds. Chesapeake Bay Research Directory - Member, Steering Committee - A regional database funded by Chesapeake Research Consortium.